I have been making these on request for awhile so I figure I should add them to the options for ordering, so this weekend I will be updating the site. Available in 1", 1.5 and 2"
Ok. That seals the deal, I needs me a girldoggy so we can play dress up. Those are gorgeous!!! 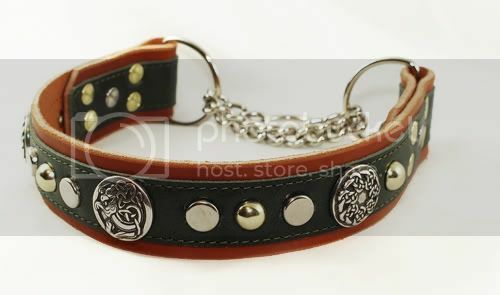 Those are some SWEET looking leather chain martingales you have there, Lisa! I remember when you made Ella one when we needed one for her training sessions as a backup collar. That was, what, 2006? Yeah, it was!!! Because it was right before the new year and it was, like, our second training session. It was pink and turquoise. I remember that collar. I cannot believe that was over 4 years ago already!!! Beautiful collars - as always. I don't think you've made a ho hum collar ever. Each one I've ever seen you post has been stunning and unique in its own way. ahhh thanks guys..I still need to get them on the option on the order form LOL...so little time so much to do. I am anxiously awaiting mine!!! Some of it will be a surprise as I've let some details up to Lisa. Those are gorgeous, as always. I got one of these Collarmania chain martingales a couple of years ago for Doc because the metal buckles on regular collars chafe his neck. It's seriously the best (and only) collar he wears on a regular basis. Love it! This product definitely gets a thumbs up from me (and Doc)!